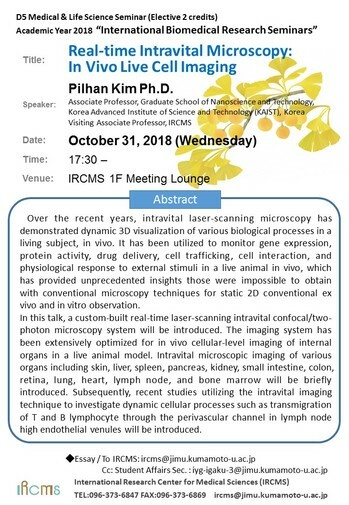 Speaker : Pilhan Kim Ph.D.
Over the recent years, intravital laser-scanning microscopy has demonstrated dynamic 3D visualization of various biological processes in a living subject, in vivo. It has been utilized to monitor gene expression, protein activity, drug delivery, cell trafficking, cell interaction, and physiological response to external stimuli in a live animal in vivo, which has provided unprecedented insights those were impossible to obtain with conventional microscopy techniques for static 2D conventional ex vivo and in vitro observation. In this talk, a custom-built real-time laser-scanning intravital confocal/two-photon microscopy system will be introduced. The imaging system has been extensively optimized for in vivo cellular-level imaging of internal organs in a live animal model. Intravital microscopic imaging of various organs including skin, liver, spleen, pancreas, kidney, small intestine, colon, retina, lung, heart, lymph node, and bone marrow will be briefly introduced. Subsequently, recent studies utilizing the intravital imaging technique to investigate dynamic cellular processes such as transmigration of T and B lymphocyte through the perivascular channel in lymph node high endothelial venules will be introduced.